Chief engineer Ephraim J. Moore and his wife, Melissa, of Port Huron, were enjoying their last meal together on the steamer Nelson Mills. The boat was churning its way up the busy St. Clair River, following a trip to Cleveland and back, and Melissa was expecting to get off when the Mills docked at Port Huron. The date was Sept. 6, 1906, and while she didn't realize it at the time, it was going to be the last day of Melissa's life. She was one of two people on that vessel who died in a collision three miles below the town of St. Clair. The Mills, under the command of Capt. Daniel Warwick, had the barge Alex Anderson in tow. Both vessels were laden with coal and bound for Algoma Mills on Georgian Bay. The stop-over at Port Huron was probably going to be a courtesy call just to put Melissa Moore ashore. It was customary for wives of the officers of the boats to accompany their men on brief trips on the lakes. As the boats slowly worked their way against the river current, they met the Western Steamship liner Milwaukee steaming down stream. Witnesses said the Milwaukee's whistle sounded twice and the Mills answered with one blast as the two vessels approached each other. Then something appeared to go wrong with the Mills steering apparatus. The wooden hulled boat veered unexpectedly across the Milwaukee's bow and there was nothing anybody could do to avoid the collision. They hit with a loud crunch, the Milwaukee's steel bow cutting deep into the side of the ill-fated Mills. The collision happened at 12:10 p.m.
Moore saw that the Mills was sinking fast by the bow and he made a frantic effort to save his beloved Melissa. He put a life jacket on her and told her to jump with the other members of the crew in the river. Melissa was apparently afraid of the water. She refused to jump and was last seen still clinging to the ship as it sunk under her feet in about 40 feet of water. 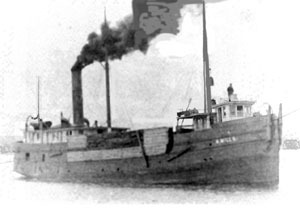 Her body later was recovered in the wreckage of the ship's cabin, which broke away from the wreck and floated to Marine City. Also killed was wheelman James Barber of Port Sanilac, Mich. Details about his death were not recorded. The Milwaukee dropped anchor and helped rescue survivors. They included Second Engineer Gib Edmondson, Fireman D. Moore and wheelsman Joseph Baird, all of Marysville, and cook Charles Nicholi of Port Huron. The Mills was abandoned where it sank.